OptimumCS-Pro is the Optimum Camera Settings tool for use where maximum sharpness over a large depth is required. OptimumCS-Pro instantly determines the focus distance and aperture that minimize the combined effects of defocus blur and diffraction. And you get a readout of how sharp that image will be, so you’ll know what to expect. OptimumCS-Pro’s functionality is revolutionary, while its versatility, intuitive operation and instant results are perfect for creative professionals who don’t want their tools to get in the way of their work or their art. TrueDoF-Pro revolutionises the way you work with depth of field. 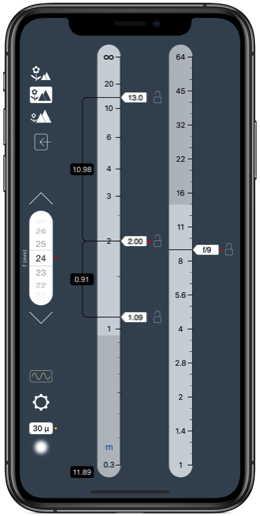 The clear, easy to use interface is uniquely flexible (and customisable): Enter whatever quantity you want (even the near or far limits of depth of field); lock any quantity; you decide what should be an input and what should be an output. There is nothing else like this. And TrueDoF-Pro utilises the most advanced depth of field algorithm available anywhere. By taking the effects of diffraction into account, TrueDoF-Pro gives the user a much more accurate indication of how sharp the image will be. 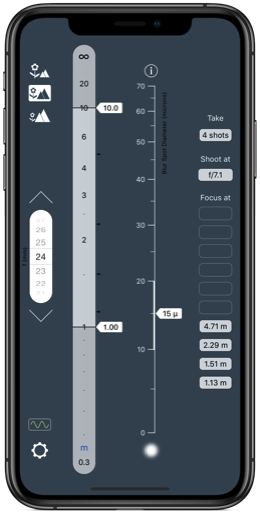 FocusStacker is the unique calculating tool for photographers employing focus stacking to achieve astonishing depth of field in landscape and architectural photography. How many shots do you need to take? On what distances should these shots be focused? What is the ideal aperture to use? With FocusStacker, you’ll have your answers to these important questions, instantly. And because FocusStacker's calculations are made using a unique algorithm derived from the one pioneered in OptimumCS-Pro, you can have every confidence in the results. All apps are currently available only on Apple mobile devices (iPhone and iPad). Which better suits your needs — an optimum camera settings tool or a depth of field calculator? And what about focus stacking? Check out the feature article, Best Practice in Working with Depth of Field. Also available are versions of OptimumCS-Pro and TrueDoF-Pro that are designed to give an initial taste of some of the capabilities of these remarkable apps. (These are suitable for photographers but are not intended for use in cinematography.) Check out the product descriptions and screenshots on the App Srore. These apps share with their “pro” counterparts the same core features: A gorgeous interface, ease of use, real-time updating of output and, above all (but conveniently hidden under the hood, as it were), the most advanced image sharpness algorithms you’ll find on the App Store. 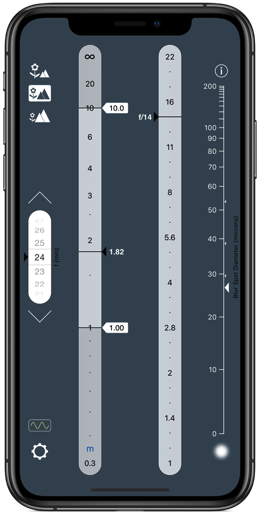 Note that the additional features of the “pro” versions, far from adding to complexity, simply add versatility and allow customisability that actually makes the apps faster and easier and more pleasurable to use (and, of course, way more useful)!